The original 1874 Fresnel lens of Cape Elizabeth Light. If you’ve ever wondered what it’s like to be inside the top of a working lighthouse, the Maine Maritime Museum in Bath would like to show you. Its newly opened permanent exhibit, “Into the Lantern: A Lighthouse Experience,” not only features a full-scale replica of the east tower of the Cape Elizabeth Light, it gives visitors the sensation of being in a functioning lighthouse. In what the museum is calling the first-of-its-kind immersive lighthouse exhibit, it uses video projection to allow visitors to experience the sensation of standing at the top of the lighthouse overlooking Casco Bay. “Into the Lantern” houses the second-order Fresnel lens from Cape Elizabeth Light, also known as Two Lights, that once guided ships into Portland. 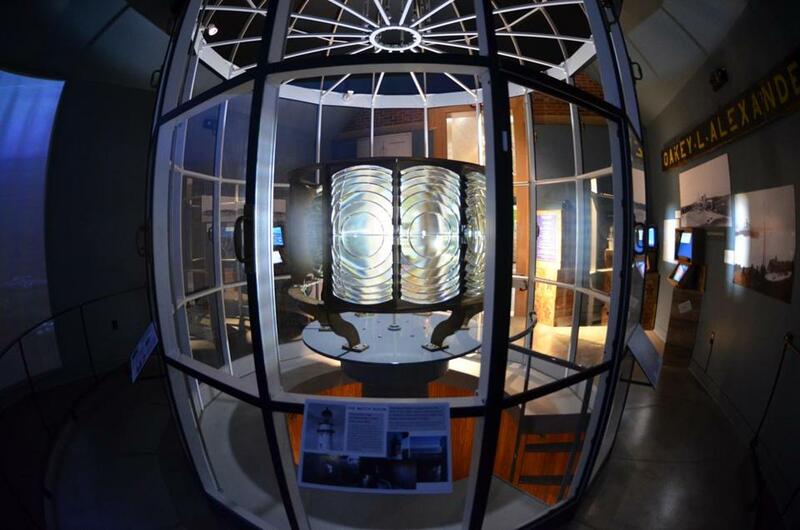 The lens in the exhibit is the original 1874 Fresnel lens that was in the east lantern until 1995. The Coast Guard’s donation of the lens to the museum sparked the idea to create an immersive experience. The exhibit includes a 180-degree media projection system with time-lapse videography of the active panorama of the Gulf of Maine, simulating the experience of standing at the top of a lighthouse tower by showcasing changing views of Casco Bay as seen from the tower. Wind machines, scent diffusers, and the sounds of the sea complete the full sensory experience. The Fresnel lens is lit and rotating on its pedestal, giving visitors a rare perspective of this historic technology. To create the time lapse, which goes from day to night and includes all seasons, the museum staff worked with a production company that installed cameras at the actual Cape Elizabeth Light, which is not open to the public. Furthermore, the exhibit, which also includes a wide range of lighthouse-related content, is on one level, making it possible for people who are physically unable to negotiate the steps of a real tower to have the visceral experience of going up into a lighthouse. The museum, which has expanded summer hours, also features several other permanent and rotating exhibits, along with daily lighthouse and nature cruises.